For scientists, sometimes the best way to study a volcano is from the inside out. That's exactly what volcanologists Dario Tedesco and Ken Sims did when they descended deep into Nyiragongo, one of the most active volcanoes in the world. 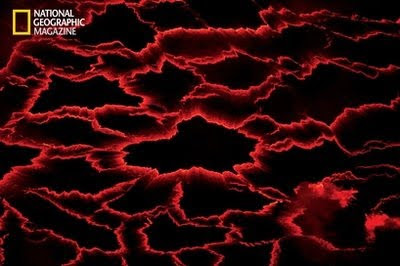 Because of its location in the Democratic Republic of Congo, where constant warfare has raged for decades, Nyiragongo has barely been studied by scientists. This lack of knowledge could prove catastrophic for the city of Goma, located at the base of the volcano -- according to Tadesco, an eruption could potentially transform the city of one million into "a modern Pompeii." 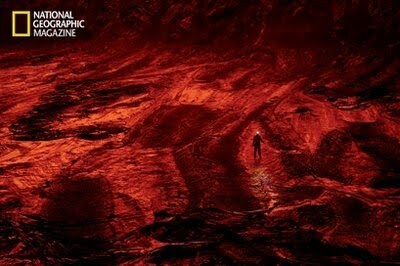 By coming face-to-face with boiling lava, Tadesco and Sims hoped to gather data that could help predict an eruption. Intrepid photographer Carsten Peter was there to capture incredible photos of their journey. 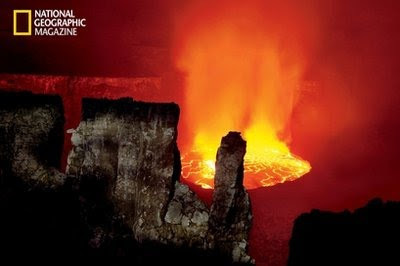 If a major eruption were to occur, molten lava could be the least of Goma's worries. Nearby Lake Kivu is infused with methane, and the force of an eruption could trigger a cloud of deadly gas to rise over the city. A unique, interactive National Geographic map illustrates the numerous threats posed by the terrain surrounding Goma.